Sorry I have been MIA the last week or so . I have been going to different events here in Philadelphia, but I am back. Anyway couple of weeks ago we took 2 great friends of ours to a Brazilian restaurant here in Philadelphia called Picanha. They loved it, but what one of our friends really fell in love with was his dessert “Tres Leches Cake”. I haven’t had this cake in years, but my dad would make it when I was younger. It is a 3 Milks cake and it’s absolutely delicious. I decide I wanted to try to make this so I called up my dad and he gave me the recipe. He did give me an easier way to make it, so if you don’t have the time to make the cake from scratch you can make with store-bought cake. Then all you have to do is just add the milk mixture. The only problem I have with this cake is the waiting (haha). I hope you enjoy it. In a large bowl, add the cake mix, follow the instructions 1 cup water, oil, and eggs. Using an electric hand mixer on medium speed, beat for 2 minutes until smooth. Pour the batter into a greased pan and bake until a toothpick inserted in the middle of the cake comes out clean, 30 to 35 minutes. Let cool. In a medium bowl, mix together the sweetened condensed milk, evaporated milk, and 1/4 cup cream. Using a fork to poke holes all over the cake. Pour the milk mixture over the cake. Place in the refrigerator until the liquid absorbs into the cake, at least 2 hours or overnight. The longer it sits the better. When you’re ready to serve: In a large bowl, add sugar and remaining heavy cream. Beat with mixer on high-speed until the cream holds soft peaks. 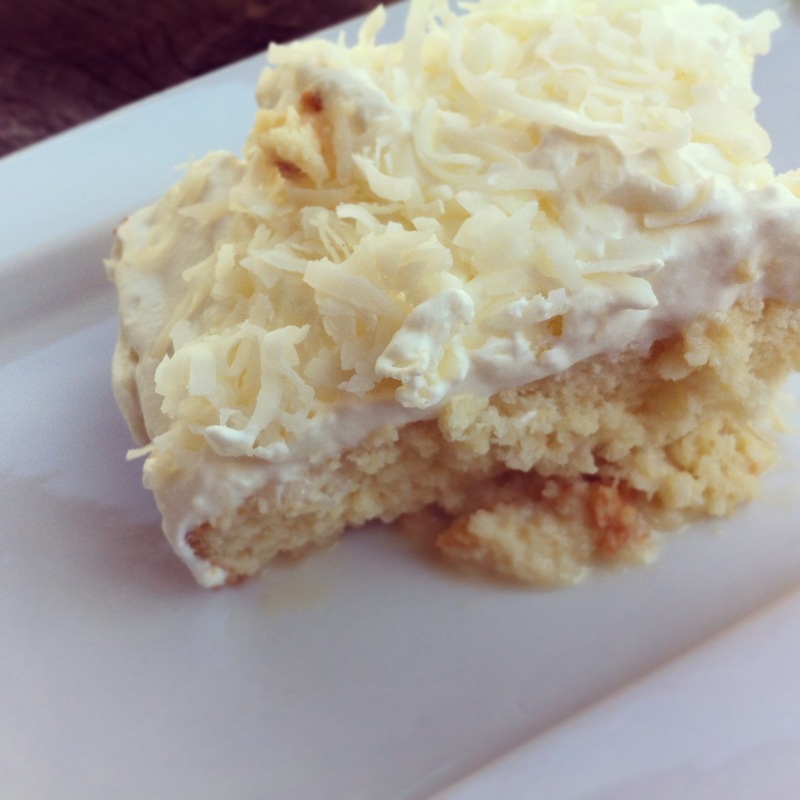 Now you can either just place a little of the whipping cream and toasted coconut on top or you can slather it all over the cake and sprinkle coconut flakes all over cake. Looks and sound great, I will have to try it, thanks.